1. In collaboration with the Ministry of Transport and Infrastructure of the Republic of Kenya, the Northern Corridor Read More Transit and Transport Coordination Authority (NCTTCA) organized an Investors’ Conference on the promotion and construction of the RSS as part of Transport Infrastructure and services. The conference took place on 28th April 2015, at the KICC Nairobi, Kenya. The Conference was graced of the presence of His Excellency William RUTO, the Deputy President of the Republic of Kenya. It was also highly attended by Hon. Ministers of Transport and Infrastructure and Ambassadors from the Northern Corridor member States of Uganda, Rwanda, DR. Congo, Burundi and South Sudan. 2. 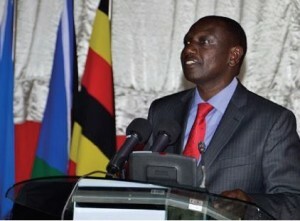 The Conference was officially opened by His Excellency William RUTO, the Deputy President of the Republic of Kenya. In his opening speech the Deputy President stressed the need of developing Infrastructure as key factor to economic growth within the member Countries. He added that Kenya has a fully-fledged Public Private Partnership (PPP) Law and a Public Private Partnership Unit at the National Treasury to spearhead all needed regulations. He confirmed the support from the Government of Kenya in the implementation of the RSS program. He closed his speech by encouraging the Private Sector to tap into the investment opportunities in infrastructure in general and in the Establishment of Roadside Stations along the Northern Corridor in particular. 3. Before the DP officially opens the Conference, the audience had right to the introducing speeches and remarks from The Ag. Cabinet Secretary, Ministry of Transport and Infrastructure (MOIT) Mr. James MACHARIA; the Principal Secretary MOIT Eng. MUSONIK; the Executive Secretary of the NCTTCA, Mr. Donat M. BAGULA; and The Director General of NTSA who was the Master of ceremony, Mr. MEJA. 4. The Cabinet Secretary Ministry of Transport and Infrastructure Kenya in his opening remarks emphasised that development of Transport logistics and Services hasbecome part and parcel of the Transport Infrastructure investment if we are to promote sustainable logistics chain development. He noted that it is high time and therefore very pertinent that the initiative of developing Road Side Stations should be a key ingredient of the development plans for the development of Infrastructure Projects. Furthermore he said the Government of Kenya fully support and embraces this program as a priority of developing the transport services and transport corridors to international standards as part of promoting seamless transport of Cargo, movement of people as well as promoting regional business linkages. He finally invited all interested investors from within and outside the region to take advantage of this business opportunity and Invest in RSS. Consider including visuals – map of 67 RSS in the various countries and typical RSS design with amenities. what are the expected impacts of the RSS project? why invest? Thanks Vincent for your very good comment, we are taking this up immediately. This is important George. After the conference a Task Force comprised of the key stakeholders in each Country where the RSSs are located is going to be implemented. The civil society can be part of the Task Force in this case. The Kenyan Task Force will be lead by the Ministry of Transport. For any requirement, please keep in touch with the Ministry you will get more clarification.